Entertaining these days is anything but simple. Taking time to prepare a full menu for the holidays can be a daunting task. With most families consisting of two working parents, and kids busier than ever, finding the time to enjoy each others' company during the holidays can feel like an elusive dream. Moreover, most grocery convenience foods aren't engineered for nutrition, and often contain surprising amounts of fat and unwanted calories, not to mention ingredients hailing from all over the map. Considering the additional hassle of planning, shopping, standing in line, driving to and from the store, then preparing a full menu during an already busy time of year, it makes sense to seek a viable alternative. Here's where we come in. It takes a serious commitment of time and energy to provide your family with a fresh, locally sourced, well executed menu. Why not rely on a professional? Let us handle the details of preparing your holiday dishes, and give you the chance to enjoy your family and friends, all the while knowing you are serving wholesome, handcrafted food, free of preservatives and additives. In short, a far superior meal than you would be able to find away from your own dining room. 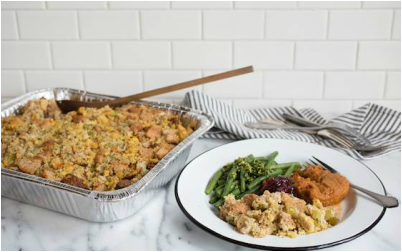 Thanksgiving Sides can be ordered by going to the Nolavore online store or by calling us at 914-3161.. Questions? Email us at nolavore@gmail.com. All Thanksgiving Sides, Desserts and Snacks can be ordered HERE.